We have been using Excimer Lasers since they were first introduced into South Africa in 1993. Since that time equipment and surgical techniques have made enormous advances. In our centre we now use an ultra-modern scanning Excimer Laser, the Schwind 500 E laser. It is a ‘small flying spot’ excimer laser with an active tracker that “locks” onto your eye and follows any movement of the eye – it even rotates to ensure the most accurate correction of astigmatism. 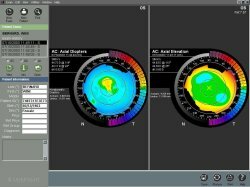 In addition, with the new Sirius wavefront and topography unit we can generate corneal maps that feed into the laser allowing us to individually treat corneas, this is known as custom ablation. Custom treatment is done at no extra cost to the patient and has been a major advance in laser surgery making the treatment even more accurate and safe; thus ensuring the best possible outcome. Three decades ago surgical techniques were introduced to permanently correct short-sightedness and astigmatism. The radial keratotomy procedure used a diamond blade to make incisions into the cornea, the front surface or “window of the eye”. These older techniques should not be confused with excimer laser treatment that has replaced the surgeon’s blade by a sophisticated, computer controlled laser that gently re-sculptures the shape of the cornea without cutting or weakening the eye. Lasik is a modern adaptation, using the Excimer Laser, of a technique that has been in existence for almost 30 years. A thin protective corneal flap is raised, rather like a trapdoor. The front surface of the exposed cornea is sculptured by the Excimer Laser. At the end of the procedure the protective flap is simply replaced. The LASIK technique leaves the original surface of the cornea virtually intact and the mild healing process results in minimal regression and no scarring. The LASIK procedure is now regarded as the most advanced refractive surgery technique. How can you find out if you are a good candidate for excimer laser? Most patients with myopia, astigmatism, and hyperopia are suitable for excimer laser treatment. Patients with presbyopia alone cannot normally be treated by the excimer laser but may have one eye made a little myopic for reading. This is called mono-vision and to determine whether it is suitable for you requires a consultation to discuss the pros and cons. Another alternative is the use of implants, which we explore further below. During the free screening test that we offer, we can give you a good idea as to whether you are a possible candidate. However, before proceeding with treatment, you will need a full eye examination by Dr John Hill to exclude any diseases and contraindications. How much myopia, or other refractive error, is present? A refraction test will measure the amount of refractive error present. A measurement of your cornea is made by computerised corneal topography that produces a contour map to show the curve of your cornea. This information is also fed into the laser to give a more accurate customised treatment. What is the thickness of your cornea? An ultrasound probe is used to measure the thickness of your cornea in microns. We will measure the size of your pupils in the dark. Your eyes will be examined to determine that no other medical eye problems are present which may interfere with the Laser procedure. A pressure test is also routinely performed to exclude glaucoma. Is your refractive error stable? Personal information about allergies and other medical conditions that may affect the laser treatment will be requested. Does your profession or occupation have a visual requirement? Do glasses or contact lenses satisfy your visual needs? What do you expect from the excimer laser procedure? Please note: Realistic expectations and the ability to follow instructions are essential for a successful result. Excimer laser treatment is an elective procedure and, as with any form of surgery, deserves careful consideration prior to proceeding. Please contact us and we will answer any questions that you may have. We offer a free screening test and we also have an educational video for you to watch. If you are a good candidate for the Excimer Laser procedure, then the decision to go ahead is entirely yours to make. Large refractive errors cannot be treated by excimer laser. If the Excimer laser removes too much corneal tissue the cornea can become weakened. With high refractive errors it is often better to avoid the cornea or perhaps use it for fine tuning later. To correct large refractive errors we need a different approach and consider the role that the natural lens plays within the eye to focus. With a phakic implant we supplement the strength of the natural lens by placing an extra lens within the eye on top of the natural lens. The phakic implant is inserted into the eye as a minor surgical procedure under local anaesthesia. The phakic implant we prefer is the “ICL” (implantable collagen lens) made by Staar, Switzerland . The phakic implant is rolled into a tight tube and placed through a minute incision into the eye, once inside it unrolls itself into the correct position. By supplementing the strength of the natural lens the phakic implant allows the patient to focus normally. Visual recovery is rapid with the patient seeing well within a day, with more improvement occurring over the following two or three weeks. Any residual astigmatism or minor refractive error can, of course, be corrected with subsequent Excimer laser surgery of the cornea. Because the natural lens is left untouched the patient is still able to focus naturally for near. In those patients over the age of 45 who are already having problems focussing for near, spectacles will be required for reading. Phakic implants have been used extensively in patients with high refractive errors during the past fifteen years, a recent large study in US Marines have confirmed their efficacy and safety. It is known that a very small percentage of patients with phakic implants will develop cataracts in the natural lens after a number of years(1 to 2 %), but these are usually older patients. If a patient does develop a cataract this is easily remedied but does require a further operation. All possible complications will be discussed with you prior to surgery. For older patients we normally recommend a different procedure where the natural lens is replaced by a special implant as opposed to the phakic implant that is inserted in addition to the natural lens. One of the most successful operations performed by eye surgeons is the cataract operation. This is extremely common and over three and a quarter million people in the USA have cataract operations every year. It is a safe and very predictable operation. It is performed when the natural lens becomes opaque or not able to transmit light anymore. In the standard cataract operation the natural lens is removed and replaced by an implant (man made lens). It is possible to calculate what strength implant is required so that the patient does not require glasses for distance vision after the operation. In patients who have high refractive errors and where the focusing of the eye is abnormal it is also possible to remove the natural lens and replace it with an implant of the correct power. The operation is exactly the same as a standard cataract operation although the indications are different. By assessing the length of the eye with ultra sound and measuring the curvature of the cornea it is possible to accurately predict what strength implant is required to allow patients to see well in the distance. If there is any residual astigmatism or other refractive error, fine-tuning on the corneal surface is, of course, possible later with the excimer laser. The operation is very simple and takes approximately 15 minutes, and visual recovery is very quick and most patients see well the next day. 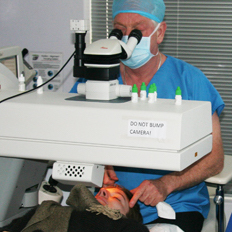 Being a minor operation it is done within our dedicated eye operating theatre. It is performed under local anaesthesia and patients are not required to stay overnight and are discharged from hospital usually within an hour of the operation. Unlike the young natural lens, the implant has a fixed focus. This is usually made for distance vision and the patient then requires reading glasses. The ideal patient for a lens implant is one who has a high refractive error and who already requires glasses for near vision. These are usually patients over the age of 45 years. In patients who are having both eyes treated, it is possible for one eye to be left slightly short sighted allowing the patient to have a greater range of vision and to see relatively well close up with one eye. This situation, were one eye sees better for distance and the other for near, is known as monovision and we will discuss this with you prior to the operation. Modern implants can also correct astigmatism in addition to myopia and hyperopia. Also for those patients wanting to dispense or minimize the use of any type of glasses, multifocal implants are available allowing good distance and close vision. Excellent results are usually obtained with these implants during daylight vision but some night vision problems can occur especially in the early months. These will be discussed during the consultation.